Do you like the convenience of a black leather waist pack to keep your hands free while shopping or traveling? Does the utilitarian style of most waist belt bags seem unattractive and boring? Our lamb leather women’s belt pouch bag combines compact size with convenient organization and an attractive designer look that most adjustable black onyx leather fanny packs women just don’t have. 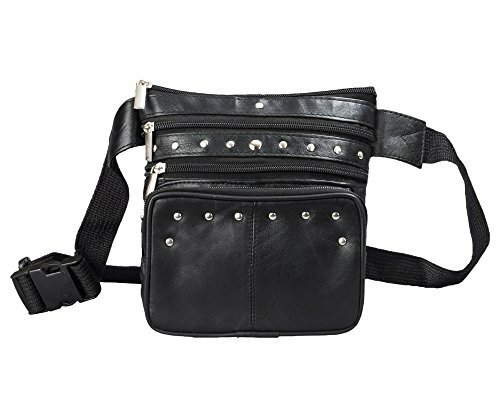 The black, soft, supple leather waist bag pack feels luxurious, and looks designer chic, with a multi-sized silver stud pattern, and is perfect as a year-round fashion accessory. This women’s money organizer waist pack was designed with organization in mind, because you have to fit a lot in a small space, and without organization it can be chaotic trying to find what you need. There are four zippered pockets in this bum bag, a cell phone pocket in front, where it’s most accessible, and spaces for cash and credit cards, keys, small notebook and pen, energy bar, and any other essentials you want to carry with this designer fanny pack. This waistpack can even be used as a dog walker fanny pack when you are out walking the dog. The waistband on this travel waist bag is made from strong nylon webbing that is both comfortable and durable, is reinforced, especially where stitched onto the leather, and adjusts up to 44” waist size so you can find a comfortable fit with this fannies pack. Can also be used as steampunk costume clothing accessory for women and little girls. You are going to L-O-V-E this very special cool fanny packs for women!